RRSH Track Switch Hot Air Blower – Spectrum, Inc.
50 years of proven technology. Class 1 & 2 installations throughout N. America. Low energy use—near zero maintenance. The Spectrum RRSH Electric Hot/Cold Air Blower is ideal for ice and snow removal. This low-profile heater is built of aluminum construction and is easily installed next to the track. The heated air flow is directed through a duct system to produce air blowing directly to the switch points to ensure proper operation of the moving parts on the track. 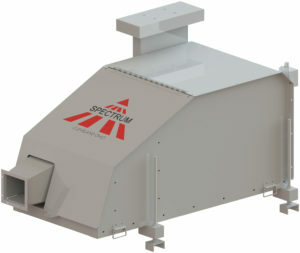 The Spectrum Snow Detection System allows for automatic operation of the RRSH Hot/Cold Air Blower. Temperature and precipitation can both be used to trigger the operation of the blower. Settings are adjustable. 3HP (19.5kW) and 5HP (45kW) models available. All Electric– Available in 240, 480 and 600 AC Voltages. Integral control for rail heaters and/or crib heaters up to 100 amps (240/480V) and up to 60 amps (600V) at 100% duty cycle. Operates Remotely, Manually or Automatically with Snow Detection System. Electrically Isolated Main Duct with High Velocity Nozzle Outlets and with rodent screens. Stagger Start System– Delays the start-up time of the optional rail heaters and crib heaters to reduce initial electrical inrush. Note: 600 Voltage models do not operate as cold air blowers, but only on high and low heat. Track Level Snow Detector– Snow/precipitation sensor for remote mounting provides added reliability and energy management, 8ft. lead included. Main Circuit Breaker– Offers additional protection between main feed panel and blower; improves safety during maintenance when controlling rods & cribs. Center Duct– 12-foot long duct for installation and heat distribution between the rails. Intake Snorkel– Helps prevent blower from pulling in rain/snow during operation and prolongs the life of the blower motor. Mounting legs– Offer 2ft. of adjustment to level the blower. Indicator Light– White indicator light to signify when the blower is on or off. Flexible Duct Extension– Stainless steel extensions at varying lengths with a high temperature silicone packing reduces installation time. Flexible Nozzles– Stainless steel at varying lengths with a high temperature silicone packing allows you to direct the air flow.